I love this Christmasy time of year. The lights, the decorations, the gatherings with family and friends, the food, the cheer, the music, the hymns, the overall camaraderie among everyone. If only time would slow down between Thanksgiving and New Year’s, but instead it always seems to be traveling at warp speed. I am trying to slow down a little bit each day and enjoy it all. 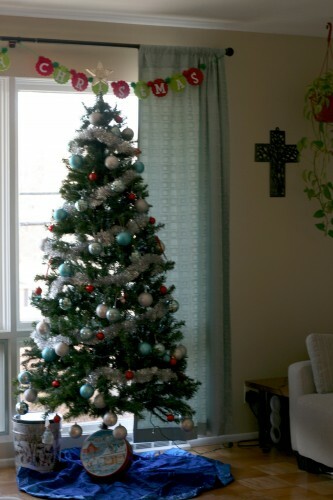 Christmas time isn’t about and shouldn’t be about stressing out. Or spending obscene amounts of money on unnecessary stuff from China. Don’t get me wrong I love the idea of gift giving. 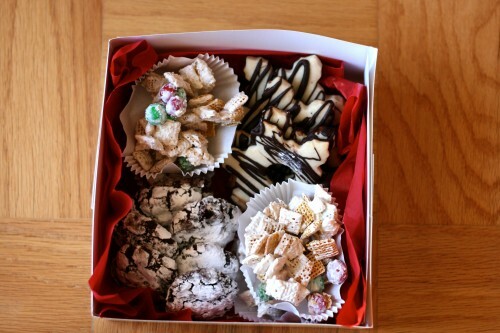 In fact, I gifted my first three boxes of Christmas goodies last week. I may be the only one out there but I love homemade/handmade gifts. 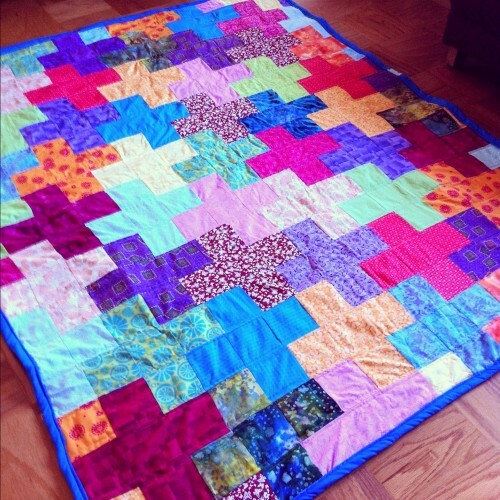 I sewed quilts for my girls last year, I’ve sewed dolls for my nieces, and a stuffed monster for one of my nephews. We’ve delivered cookie platters to our neighbors. Maybe I’m old fashioned and cheesy, but I’m ok with that. This year I delivered two treat boxes to my husband’s office and another treat box to the wonderful ladies at inclosed (check out their uber cute letterpressed wedding invitations and Christmas cards) I take such pride and joy in making something from scratch for others, whether it is coming from my kitchen or my sewing machine. Do you give homemade/handmade gifts? Penelope and I were busy in the kitchen last week. I love that she has such a great interest in helping me in the kitchen. She loves to crack the eggs because she can finally do it without getting any shells into the bowl. 🙂 She poured in the sugar and the flour. She shook up the cookies in the powdered sugar. She helped package them up in the boxes. I had a blast making these cookies with her to give away to our friends. We have many more Christmas goodies planned, so stay tuned! 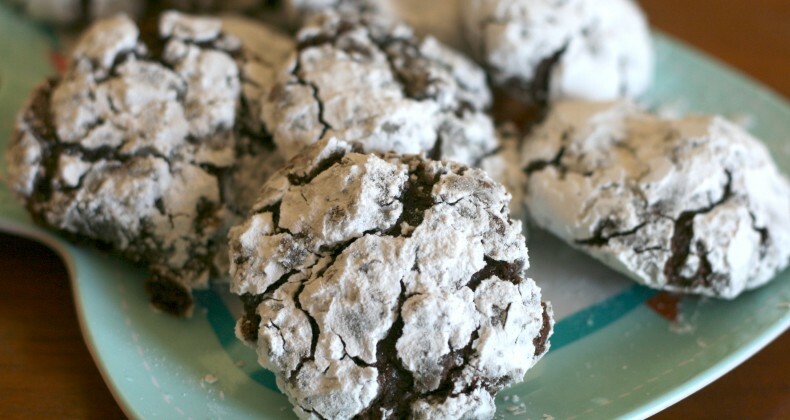 Today’s recipe is for the Chocolate Crackle (Crinkle) Cookies. These cookies are fudgy and almost brownie-like. They are rolled in powdered sugar before baking. I also made a gluten free version so I will share both recipes with you. The gluten-free cookie dough was less sticky and easier to work with than the regular cookie dough. Don’t leave out your celiac/gluten intolerant friends this holiday season. Whip them up a batch too! Donât preheat the oven yet, this dough will need to chill for 2 hours or so. Melt dark chocolate gently in the microwave in 30 second increments. Mix dry ingredients (flour, cocoa, baking powder, and salt). In your mixing bowl cream sugar and butter together on low, then beat in eggs and vanilla. Pour melted dark chocolate over the creamed butter and sugar, mix, then add dry ingredients & milk (alternating between the two to prevent puffs of flour getting all over the place). The dough will be very sticky. Cover the bowl loosely in plastic wrap and chill for approx 2 hours, or until dough is hardened and can be handled. Preheat oven to 350. Scoop out spoonfuls of hardened dough, roll between your palms to form a ball, then toss the ball into a zip topped bag of powdered sugar to coat it. If the dough gets too sticky to handle, pop it back in the fridge or freezer to cool it back down. Line cookie up on the sheet (not too closely â they spread) and bake at 350 for 12-15 minutes. Let cool on the pan for a few minutes before moving to a cooling rack to cool completely. Preheat the oven to 350F. Line two baking cookie sheets with parchment paper. Set aside. In a mixing bowl whisk together all the dry ingredients (minus the powder sugar). In a small bowl lightly beat the eggs and mix them with the grapeseed oil. Slowly pour the oil-egg mixture into the dry flour mixture. The flours will seems to fall apart, having a grainy texture. Increase the speed and keep mixing for 1-2 minutes until the dough comes clean from the sides of the bowl and wraps around the paddle attachment. Take the cookie dough out and form 40 small cookie balls. Place the cookies, in batches, in a zip top bag with the powder sugar and give them a shake, then place them on a parchment lined cookie sheet. Bake the cookies for 18-19 minutes. Leave to cool slightly on the cookie sheets before removing. Cookies can be stored in an air-tight container for few days or even placed in the freezer for a longer life (if they last that long). Thank you for linking up jamie! Now please move in across the street! 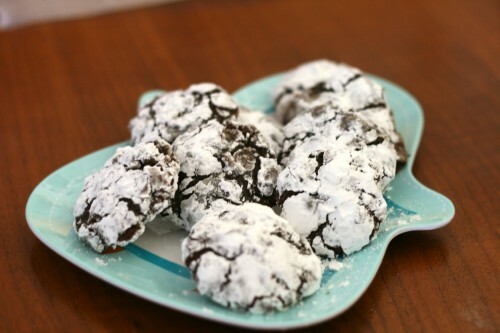 I love that these crinkle cookies have real melted chocolate. Can’t wait to try them!